Kamigamo Shrine was founded in 678. Its formal name is “Kamo-wakeikazuchi Shrine (賀茂別雷神社),” and this “is one of the oldest Shinto shrines in Japan” and “one of the 17 Historic Monuments of Ancient Kyoto which have been designated by UNESCO as a World Heritage Site”. 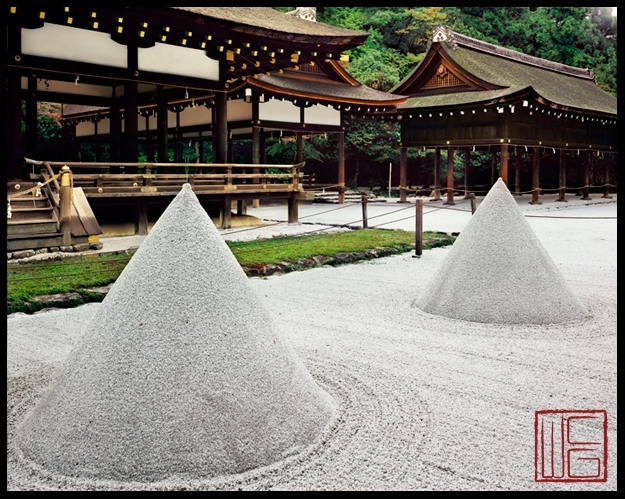 (http://en.wikipedia.org/wiki/Kamigamo_Shrine) The cone shaped white sand mounds in front of “hosodono/細殿 “are called “tatezuna/立砂”, and these geometrical and abstract mounds represent the sacred mountain called “Ko-yama/神山”. This may be related to the sand and salt used to cleanse and purify the North-East direction which is considered unlucky. The color white is considered as a sacred color in various cultures.